Carmelita McGrath was born in Branch, NL, and received her B.A. and B.Ed. from Memorial University. Her first collection, Poems on Land and Water, was published by St. John’s-based Killick Press in 1992. 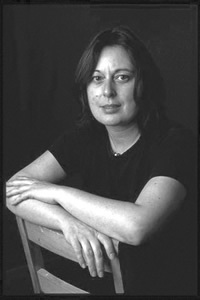 McGrath was awarded the Atlantic Poetry Prize for her following collection, 1997’s To the New World. Along with poetry, McGrath has written novels and children’s literature, as well as edited several collections and anthologies. She has been heavily involved in a number of writer’s groups, including the League of Canadian Poets, the Writer’s Union, and the Writers’ Alliance of Newfoundland and Labrador, which she helped to develop. Her work as an editor and organiser has made her a pivotal part of the Newfoundland and Labrador writing scene. McGrath continues to live and work in St. John’s. you want to lie down in it. and other things we didn't have to sit on. antidote to my grandfather's lingering death. and the curve of its back a harp or heart. so distant from the past. the gales, misleading fogs played treachery. into a storm that went on and on. even if it meant going under. their bodies against mine and sucked my breath. to home. They sent my younger sister in my stead. the weight of my grandfather's death press on me. reading stories in a leafy light. had photographed him reclining chill and quiet. Published in Words Out There: Women Poets in Atlantic Canada, 1999. Used with permission. Copyright remains with the author. Critical Analysis: The Anticipation of Death in Carmelita McGrath's "Reclining"
Carmelita McGrath’s “Reclining” explores the anticipation and acceptance of death. McGrath's speaker identifies herself as the “comfort child” (10), who has been sent to live with her grandparents to distract them from the impending death of her ailing grandfather, a role she comes to reject. so distant from the past (15-17). Words mangled; my grandfather’s stories dissolved (21-23). Even in his final violent fits, the grandfather’s bed is described as being “tossed like a skiff” (25), a further evocation of nautical imagery to associate with the speaker's grandfather. McGrath evokes stark, plain, and direct images, creating no illusion or ambiguity about the nature of the grandfather’s death. Just as suddenly as it appears, this sea imagery is gone again. With it goes the grandfather as human being, the last surviving link to a fading way of life. The lines remain long as an inheritance and reminder of the grandfather's influence. The speaker again turns her mind to the chaise and the act of reclining, but now these thoughts are clouded by images of her grandfather’s body in wake. To the speaker, he has become separated from the thrilling and concrete world of the sea, her immediate physical environment, and has instead entered the realm of the intangible, the unobtainable, and the absent. McGrath, Carmelita. “Reclining.” Ed. Jeanette Lynes. Words Out There: Women Poets in Atlantic Canada. Lockeport, NS: Roseway, 1999. 37-38. Print. McGrath, Carmelita. “Booman.” Compton et. al. Print. 255. ---. The Boston Box. Illus. Rochelle Baker. St. John's: Tuckamore Books, 2003. Print. ---. Celebrating Diversity, Respecting Differences. St. John's: Women's Policy Office, 2000. Print. ---. The-Dog-Next-Year. Illus. Nancy Keating. St. John's: Tuckamore Books, 2001. Print. ---. Escape Velocity. Ed. James Langer. Fredericton: Icehouse Poetry, 2013. Print. ---. Ghost Poems. St. John's: Running the Goat, 2001. Print. ---. "Goodbye." Newfoundland Quarterly. 105.3 (2013): 25. Print. ---. Hearts Larry Broke: New Fiction from the Burning Rock. St. John's: Killick Press, 2000. Print. ---. “How to Leave an Island.” Compton et. al. Print. 256. ---. Interview by Jeanette Lynes. “Carmelita McGrath's New World.” Words Out There: Women Poets in Atlantic Canada. Lockeport: Roseway, 1999. 139-143. Print. ---. “I Want Your Voice.” Carol Rose and Joan Turner, ed. Spider Women: A Tapestry of Creativity and Healing. Winnipeg: J. Gordon Shillingford, 1999. Print. ---. “I Would Have Liked to Say I Was Irish.” The Backyards...et al. 2003. Print. ---. “Let Us Go and Find a Place of Worship.” Compton, Anne, Laurence Hutchman, Ross Leckie, and Robin McGrath, ed. Coastlines: The Poetry of Atlantic Canada. Fredericton: Gooselane Editions, 2002. Print. 253. ---. Many Friends, One World. St. John's: Breakwater Books, 2008. Print. ---. Notes from a Submission Opposed to a 15% Tax on Reading, 1996. Print. ---. Poems on Land and Water. St. John's: Killick Press, 1992. Print. ---, ed. Signatures: Newfoundland Women Artists and Writers. St. John's: Killick Press, 1996. Print. ---. “Solar Eclipse, St. John's, Newfoundland.” Compton et. al. Print. 254. ---. Stranger Things Have Happened. St. John's: Killick Press, 1999. Print. ---. “Time Travel with Stories.” Learning About the Past. St. John's: Writers' Alliance of Newfoundland and Labrador, 1996. Print. ---. To the New World. St. John's: Killick Press, 1997. Print. ---. “Two Children in White.” Eds. Ed Kavanagh, Marion Cheeks, and Deanne Hullett. Savoury on the Tongue: An Anthology of Writing from Newfoundland and Labrador. St. John's: Writers' Alliance of Newfoundland and Labrador, 2002. Print. ---. Vistas. St. John's: Stone Cold Press, 2005. Print. ---. Walking to Shenak. St. John's: Killick Press, 1994. Print. ---. “Wallpapering the Crooked Room.” The Backyards of Heaven: An Anthology of Contemporary Poetry from Ireland and Newfoundland & Labrador. Eds. Stephanie McKenzie, John Ennis. Waterford: WIT School of Humanities Publications, 2003. Print. ---. "We Often Call Them Stoic." Newfoundland Quarterly. 105.3 (2013): 8. Print. ---. "With Apologies to the Little Dove." Malahat Review. (2012): 36. Print. McGrath, Carmelita, Barbara Neis, and Marilyn Porter. Their Lives and Times: Women of Newfoundland and Labrador: a collage. St. John's: Killick Press, 1995.Print. McGrath, Carmelita and Helen Woodrow. Wayfaring: Journeys in Language, Learning, and Culture. St. John's: Harrish Press, 1998. Print. McGrath, Carmelita, Judith Burnell, Cathy Power, and Lorna Simmons. Single Parents' Handbook. St. John's: Provincial Advisory Council on the Status of Women Newfoundland and Labrador, 1985. Print. McGrath, Carmelita, and Kathryn Wellbourn. Desperate Measures: The Great Depression in Newfoundland and Labrador. St. John's: Writers' Alliance of Newfoundland and Labrador, 1996. Print. McGrath, Carmelita, Linda K. Cullum, and Marilyn Porter. Weather's Edge: A Compendium. St. John's: Killick Press, 2006. McGrath, Carmelita, Sharon Halfyard, and Marion Cheeks. To Be My Father's Daughter. St. John's: Educational Resource Development Co-operative, 2008. Print. Anger, Dorothy C., Carmelita McGrath, and Sandy Pottle. Women and Work in Newfoundland. St. John's: Royal Commission on Employment and Unemployment, Newfoundland and Labrador, 1986. Print. Callanan, Mark, Robin McGrath, Michael Crummey, Mary Dalton, Carmelita McGrath, Lisa Moore, and Agnes Walsh. Riddle Fence. St. John's: Writers' Alliance of Newfoundland and Labrador, 2007. Print. Delisk, Jennifer. “Diverse Voices.” A Rev. of Weather's Edge: A Compendium. Canadian Literature (192): Spring 2007, 162-164. Literature Online. Web, print. 11 Aug 2011. Hynes, Joel, Carmelita McGrath, and Kathleen Winter. EarLit Shorts 1. Tors Cove:Rattling Books, 2008. Print. Hynes, Joel, Merrill Francis, Carmelita McGrath, Kathleen Winter, Janet Russell, and Susan Rendell. EarLit Shorts 1: An Audio Short Fiction Anthology. Tors Cove: Rattling Books, 2008. Sound recording. Jamieson, Don, and Carmelita McGrath. A World Unto Itself. St. John's: Breakwater Books, 1991. Print. ---. No Place for Fools. St. John's: Breakwater Books, 1989. Print. Porter, Marilyn. "A Conversation with Four Newfoundland Women Writers." Atlantis: a Women's Studies Journal (22.2): 1998. Literature Online. 39-46. Web, print. 11 Aug 2011. White, Marian F., Carmelita McGrath, and Kathleen Winter. New Realities in Health Care and Job Safety. St. John's: riters' Alliance of Newfoundland and Labrador, 1998. Print.